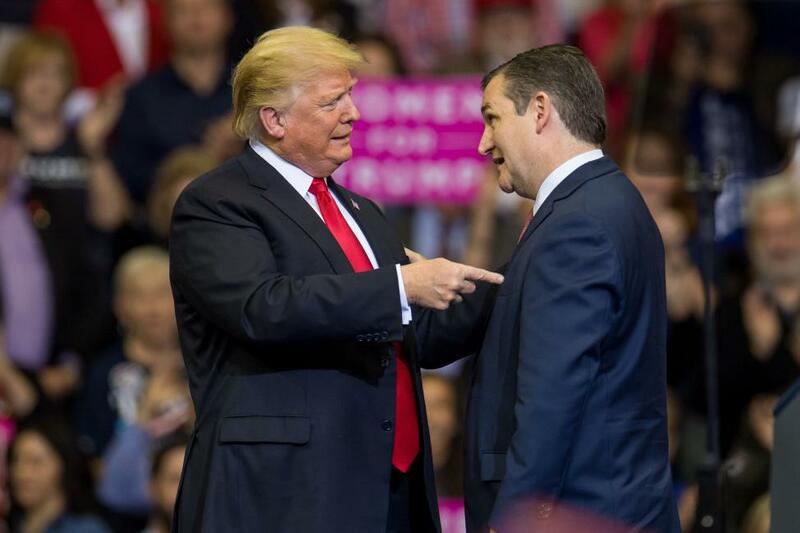 President Donald Trump set aside his differences with Texas Sen. Ted Cruz during a rally in support of his candidacy in the midterm elections on Monday. Trump embraced Cruz as he took the stage at the Toyota Center in Houston as he praised the Senator seeking re-election in November and jokingly referred to their contentious campaign against each other during the 2016 presidential primary as a "love fest." "We had our little difficulties," Trump said. "It got nasty, and then it ended. And I'll tell you what - nobody has helped me more with your tax cuts, with your regulations, all of the things we've been doing with your military and your vets, than Sen. Ted Cruz." Early voting began in Texas and 5 other states Monday, including Arkansas, Alaska, Florida, Idaho and Massachusetts. "In just 15 days the people of Texas are going to re-elect a man who has become a really good friend of mine," Trump added. Earlier in the day Trump revoked the nickname "Lyin' Ted" which he bestowed on Cruz during the primary. "He's not Lyin' Ted anymore. He's Beautiful Ted," Trump told reporters at the White House before departing for the rally. "I call him Texas Ted." Cruz also had praise for the president as he took the stage before Trump, saying he looked forward to returning the favor on the trail for Trump's re-election campaign in 2020. "I'm going to make a prediction to every person here: In 2020, Donald Trump will be overwhelmingly re-elected as president of the United States," Cruz said. "I am honored that President Trump is here endorsing and supporting my campaign and I look forward to campaigning alongside him in 2020." Trump took aim at Cruz's opponent U.S. Rep. Beto O'Rourke, D-Texas, who represents a district in the El Paso area. "Ted's opponent in this race is a stone cold phony named Robert Francis O'Rourke," Trump said. "He pretends to be a moderate, but he's actually a radical open-borders left-winger." Trump again criticized U.S. immigration policies, for which he placed the blame on Democrats, as he discussed the caravan of Central American migrants moving north through Mexico. Earlier Monday, Trump threatened to cut aid to Guatemala, Honduras and El Salvador after the caravan grew to more than 5,600 people Sunday. "This will be the election of the caravan, Kavanaugh, law and order, tax cuts and common sense," Trump said. During the rally Trump also embraced the title of a "nationalist," standing in opposition to "globalists" who want "the globe to do well, frankly not caring about the country so much." "You know what I am, I'm a nationalist," Trump said. "Use that word." Trump went on to say he was proud to hear his approval in foreign countries was low, as he believes it indicates his foreign policy is working.